I don't know about you guys, but normally I try to eschew the whole 'Android is cheap' debate. It's sometime to hard to shake when it comes to some of the truly lower end devices. But when the device isn't at the bottom end of the spectrum, but the price is... it's hard not to get excited and to recommend it. Telus (and Koodo) are the first to offer the hugely affordable device. Listing at $200 (or free on a contract). Unfortunately, like the Moto X, the device was touted by Motorola to be customizable, but here in Canada we only get the plain jane versions. Below I've given the database of Canadian devices, so you can compare the specs and prices of the devices across the spectrum. 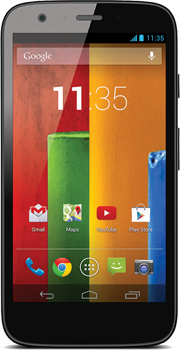 What do you get with the Moto G? Not the 'top end' of the specs, but it's not meant to be. And really, it's not the low end either - it's just a hell of a deal for anybody looking to upgrade their older phone without buying a new contract.